There has been some big news in the ebook world recently, and authors should know about these changes in order to take advantage of them. I wrote a post back in October that lamented the situation for international publishers, but things have certainly changed! If you didn't hear the news yet, Apple released their iPad last week after months of secrecy and online hype from fans. For all the details on the device, read this post. For writers and readers, there will be an iBooks app which will contain ebooks from some major publishers but there is no idea yet how indie authors will be able to publish on the app. It is apparently DRM only, but I can see that changing as they changed music after a while. It is certainly a multi-functional device, and I will be having a look when they get to Australia, although the website currently has the iBooks only available in the US. If you are a published author, then check with your publisher whether your books will be in the iBooks store. If you're indie, then we're waiting to see what will happen! If you want to get on the Apple bandwagon right now, you can still create an iPhone app for your books or your brand that is globally available through the app store – and the iPad will still be able to use the apps. Some authors who have done this recently are Scott Sigler, Gary Vaynerchuk's Crush It as a Vook and Tom Evans, The Bookwright. (Tom will be coming on the podcast soon to talk about how he did it). Also, check out this article with Al Katkowsky who released a popular iPhone app. What does this mean for you? If you have books that you own the digital rights to, then get them onto the Kindle, either through the Amazon DTP or with Smashwords below. If you are a published author but you own the digital rights, you might want to follow the example of Stephen Covey, self help author of “7 Habits of Highly Successful People” who has gone directly to Amazon with his ebooks. Here's why I like the Kindle and how it has changed my reading habits. I am still a Kindle fan, and I buy more books on it every day. It doesn't need to be multi-functional because I only use it for reading – no distractions. So even if I do invest in the iPad sometime, it won't be a dedicated Kindle replacement. Smashwords.com expanded their offering last year to include publishing on the Kindle as well as Sony Reader, B&N.com and in many other ebook formats. The site remains the easiest to use as it formats your book for you from a basic text edition. They have recently won the distribution of ebooks for BookViewCafe, a collective of well known writers including Ursula Le Guin. You can register and load your books directly at Smashwords.com. Here is an article with some tips for publishing with them. Last week the DigiBookWorld conference kept many of us glued to Twitter and the blogs to see what was going on. That the conference even exists demonstrates that times are changing, so if you are not convinced about digital publishing, then check out the roundup of the posts here and the links from the main site here. That's it for the round-up! Are you excited about ebooks? Do you have a Kindle? or are you an e-skeptic? I am wondering whether you have noticed any ebook commentary about childrens or other type of picture books. I investigated smashwords and photos, and I think images, can’t be converted to plain text files. I believe means picture ebooks will not work on a ebook reader although they might work on a PC. Are childrens/picture books going to be left out of the ebook revolution? I think the new iPad is a fantastic start at really bringing the opportunity for ebooks for children alive. The beauty of children’s books are the illustrations which is where the kindle was lacking. As a publisher of multi-media picture ebooks for children the introduction of colour e-readers is a fantastic step forward meaning we can be part of the digital revolution. Neal is getting kids books out on the iPhone and apps are perfect for pictures. There are lots already on the PC but the apps are the first more mobile books for kids. It wouldn’t work on the Kindle, but certainly the iPad will be better for kids as it is bigger. The apps like Neal’s will work there too I presume. I hope that helps! This has been the first article I have read concerning color, photographs, pictures & the whole kindle vs ipad epublishing area. I subscribe already so it made a good read this morning. Many authors have voiced unhappyness with Amazon in the past. In particular POD. I feel that all this opening up by Amazon is indeed due to competition from the ipad. If there was no ipad, I think we would still be stuck in the same place. Competition always raises the bar a little. There is currently no option to realistically offer a photography book on the kindle. The ipad is basically screaming out that its built for just this. As someone how works in both text & image, I can see only one option here. I was disapointed at the ipads technical specifications. And no one knows yet just how it really will feel when reading a 300 page novel on it (I have concerns), but if/when it takes off, either in this version or the next in a few years, I know where I want my work seen. Hi Dave – you’re right. The iPad will be great for photo books, children’s books – anything that needs colour pictures to work. Straight fiction and non-fiction are fine on the Kindle but any more needs an app like device. Let’s hope Apple enable a self-publishing option – maybe through a site like http://www.Blurb.com which specialises in photobooks. We shall see! Yes the ipad will be super for picturebooks and you’ll hopefully see our upscaled version of red apple ( also available on itunes now for the iphone and ipod touch )when the new device launches. I attended your day at Mt Cootha restaurant last September…at the time you were offering a course on writing e-books and self publishing and selling on Amazon. I saw the new iPad on the news and looks fantastic but also quite large…things are changing so fast (once again) I’m not sure I can keep up :-)! If you are still offering that course is it a live or online? Am interested in doing something concrete about writing this year, and wanting to make at least a little money online. I am now taking bookings, so please let me know if you would like to come. There is a max size for the class. I do have an online course, Author 2.0 which is a lot more detail about each of the topics covered – however, I am currently updating that course for relaunch later this year. You would get a discount if you come to the workshop anyway. I’m super excited about all the e-readers. As much as I love print, I absolutely see that’s where we’re going and I’m eager to be a part. I like Smashwords and will probably use them when releasing my self-published collection as an eBook sometime this year. On the iPad, I’m disappointed that there has been so little talk about eInk following its release. People say Apple is now a strong competitor in the Reader field, which makes me think that eInk is beginning to be less of a key feature. @Sean – me too, just gimme more gadgets! @Benjamin – Smashwords is great, and you are right on eInk. The iPad will be reflective, hence Kindle is still preferable for plain text reading. I think iPad will be very cool for kids, but straight text novels – Kindle still wins. This is a truly helpful article… I’ve started getting confused about ebook readers and this helps me sort it out. Wonder what we’ll have in another 18 months? 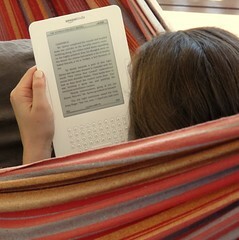 The iPad seems great, but is it comfortable to hold and read, curled up in bed or a chair? I see a trip to the apple store in my future. Hi Anne, I definitely curl up with my Kindle and also my iPhone so I think the iPad could be similar 🙂 so sleek and smooth…. I think the ipad is a pretty good looking device, but I cannot imagine it really being a threat to Kindle and Sony Readers due to the size of the thing-it weighs over a pound-and is big. It would be very uncomfortable to hold for more than a few minutes at a time. That’s interesting – I didn’t know it was so heavy. I do like the sleek Kindle feel! This is not true: if the ebook is purchased from a country different from USA or UK they take ONLY 35%, and this is obviously true for all non-English authors.